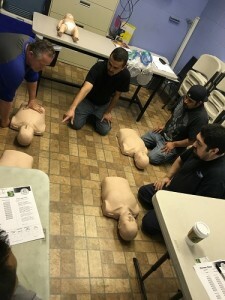 Some jobs absolutely require CPR certification in order to even apply, and our courses are sure to help you achieve that goal. In accordance with CPR guidelines, we train adults to perform Save & Exit life-saving maneuvers that may come in handy sooner than you think. In our child and adult CPR instruction courses, you will learn how to assess the scene of an incident, respond to an emergency, and understand legal issues that may surround the use of CPR. In this class, you will learn about the significance of personal protective equipment and how to position individuals for proper recovery. Of course, the class also covers the basics of CPR and choking care for both adults and children who may require assistance. This course is designed to give responders the knowledge and skills needed to respond confidently and effectively in an emergency. Skills covered: adult, child, and infant CPR. The uses of a pocket face mask, foreign body airway obstruction, and the use of AED (Automated External Defibrillator). This course is designed to give responders the knowledge and skills needed to respond confidently and effectively in an emergency. Skills covered: adult, child, and infants CPR. The uses of a pocket face mask, foreign body airway obstruction, and the use of AED (Automated External Defibrillator). The basic First Aid production of course covers patient assessment, bleeding and fracture management, cardiac emergencies and other acute injuries and illnesses. This course covers the understanding of bloodborne pathogens are, and why they are dangerous. Learn the routes of exposure, and the use of personal protective equipment (PPE). Understand what resources are available to employees in the workplace, responding safely to an emergency at work. This course is designed to meet the regulatory and credential training requirements for childcare workers. 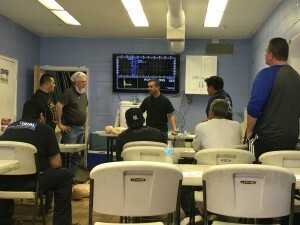 This course covers basic First aid, CPR, and AED (Automated External Defibrillator) skills for children such as: children breathing problems, proper compression and breaths to an infant or child, stop bleeding that can be seen. This is just one of the many other services we provide besides security. At Kysmet Private Security we’re not your average Private Security service. We Train Adults to Perform Life-Saving Maneuvers.